PEOPLE of all ages who would like to try dinghy sailing can “push the boat out” during an open day at a Ripley lake. Papercourt Sailing Club is running taster sessions at its base in Polesden Lane on Saturday 13 May. The club – which was Royal Yachting Association Club of the Year in 2013 – offers year-round dinghy sailing for all the family on its 45-acre lake. The open day, from 1pm to 4.30pm, is in association with RYA Push the Boat Out 2017. 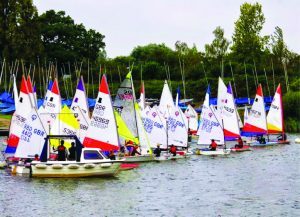 This is a national event, with hundreds of sailing clubs and training centres around the country offering free or low cost “have a go” sessions. As well as being an RYA Volvo Champion Club and an RYA Training Centre, Papercourt also has RYA Sailability Foundation Status. It has a youth and adult beginner programmes and activities range from cruising evenings to regular racing. For those that prefer to stay on dry land, there will be free tea and cakes on offer in the clubhouse overlooking the lake. For further details visit www.papercourt-sc.org.uk find the club on Facebook or call Frank Brown on 07888 773 799.